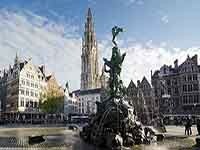 Antwerp is the second largest city in Belgium. It is located on the Schelde River and is one of the largest sea ports in the world. In addition, Antwerp is also a city of art, there are many museums, galleries, art workshops.